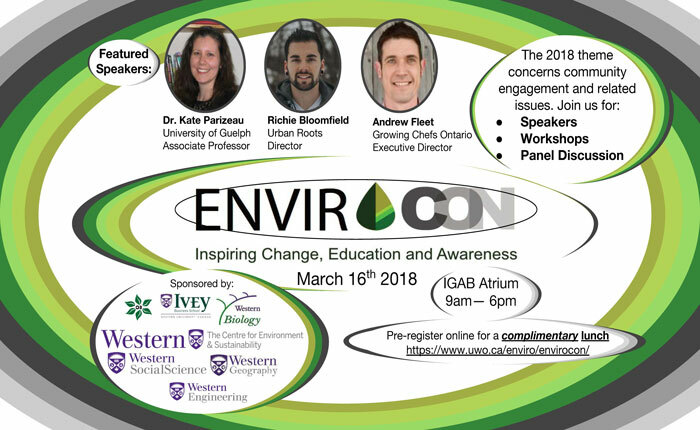 EnviroCon is an interdisciplinary conference organized every year by students of the Collaborative Graduate Program in the Centre for Environment and Sustainability at Western University. EnviroCon 2018 will provide a forum for a broad range of topics in the Sciences, Engineering, Social Sciences, Business, Policy, and Management. The colloquium is FREE to attend and participate in. This event aims to bring together the knowledge and research of undergraduate and graduate student, faculty and community members involved in environment and sustainability. Andrew Fleet, Executive Director of Growing Chefs Ontario. There will be student presentations that are accessible to a diverse and broad audience, a hands-on backyard ecology workshop, sustainability information booths, and an expert panel discussion on sustainable food practices.